It had taken a long time to reach this place. Eight hours of driving – Or a lifetime, depending on how you looked at it. A breeze roughened the water and she pulled her jacket close, then shut her eyes and filled her lungs, absorbing the rank smell of high-tide seaweed and salty turf. Ullaness – a place of legend. She could almost hear Ulla’s name whispering through the marram grasses. But then again, she thought, nothing in her grandmother’s stories made a straight connection either. She could hardly believe she was here. The place was etched so deeply into her psyche it was almost part of her being. Familiar and yet quite unknown. She watched as a string of seabirds flying low above the ocean rose to become silhouettes against clouds now edge-lit by moonlight. What a sight! Timeless and unchanging. It must have looked the same to the nomadic people who once came here to gather shellfish, and to those who followed them and then settled, and built houses. Tides and time had sculpted the shoreline, but this view must be unaltered, and Libby felt the centuries shrink around her. Ulla herself must once have stood here, a thousand years ago. And Ellen too – her grandmother’s grandmother, whose stories of Ulla had been woven into Libby’s childhood – and she wondered again at the darker threads in the weave. Generations might divide them, but standing here now she felt herself bound by the connection to both these women, held by a sense of otherworldliness in the strange stillness of the place. The archaeological work planned for the summer might throw light on Ulla’s legend, but Libby had her own reasons for being here, her own questions to ask. In a few hours, dawn would filter through her grandmother’s bedroom window on the far side of the Atlantic, and the old lady would stir in her bed, emerging from under her gaily coloured quilts. As a child, in the summer holidays, Libby loved to go with her at daybreak, hand in hand, down to the fishing stages to watch the Gosse Harbour boats set off laden with crab and lobster pots, the chill morning air laced with salt and diesel. And when the boats had gone she would sit on the wooden landing, leaning her head against the mooring post, her short legs dangling, and think of the stories the old woman had told her. Of Ulla, and of Ellen who had come from Scotland, bringing the stories with her. And in her childish mind the two women had become hopelessly entangled, existing in a place she could only imagine, two thousand miles away across the ocean in Scotland. And Libby had felt certain that Ulla must have been as good as she was beautiful: a lovely Norsewoman, blown in on a ship by the north wind, her dying lover beside her, fleeing her husband’s wrath. In her picture book of legends there was an illustration of the fabled Isolde, and Libby had imagined Ulla to be like her, tall and slender and very beautiful, while Odrhan, the legendary monk, would have been as handsome as the knightly Tristan. The legend of Ulla had, for Libby, been as compelling as that of those starcrossed lovers, all the more so because it was personal, as Ellen’s stories had connected her to this place, Ullaness, where the legend had been born. It was only later that her grandmother had explained about Ellen’s final years, when all was neither beautiful nor good. Libby rose, reminding herself that she was also here to do a job, and made an effort to bring her mind back to the present. She swept a more professional eye over the landscape and tried to get a grip on how it all hung together. The ruined structure at her feet was Odrahn’s cell, so they said, and, beyond the curving line of the southerly beach, she could see the roofless nave of St Oran’s Church, where Ellen had once worshipped. Ferns had taken root in the crumbling masonry and birds nested in niches left by fallen stones. And there, beside the church, was the abandoned manse where Ellen had worked, its broken roof slates caught in the gutters. Planks had been nailed across the door. Beyond church and manse she could see the remains of cottages, disappearing into a tangle of brambles and nettles, and wondered for a moment where Ellen might have lived. The abandoned dwellings could tell her nothing, settling back into the landscape and returning to the natural world, mute witnesses to the fact that if there had ever been a larger community here, it was long gone. Only Sturrock House, the landowner’s residence, remained inhabited. Her gaze followed the curve of the northern beach where, somewhere amongst the sand dunes, there was the mound that they would excavate this summer. From here it looked like just another dune, but she’d found it earlier and had stood staring down at the curved row of stones that the winter storms had exposed. It was now obviously a man-made feature, but was it a burial, and if so could it really be a physical part of the legend? Almost too much to hope for. There had been a frisson of excitement amongst her colleagues when the news had reached them of what had been reported following a particularly wild storm, and parallels had quickly been drawn with similar stone settings which had turned out to be graves, significant graves, boat-shaped Viking-age graves – and there had been general agreement that the site should be excavated before the evidence was lost. Despite her own attachment to it, the legend of Ullaness had never been in the same league as that of Tristan and Isolde, but it did, after all, refer explicitly to the burial of a Viking warrior. Professor Declan Lockhart, an early medievalist at the midlands university where Libby had a short-term contract, had been assigned to the project and an advertisement had gone out for an assistant to help him run it. For Libby, the job was custom-made, and she had applied. She’d not mentioned her personal connection at the interview, nor had she mentioned her grandmother’s stories when she was offered the post. They had, after all, no bearing on the ancient site. She moved off, back along the causeway. Tomorrow she would inspect the mound in daylight, putting the personal aspects aside, and start to think seriously about the summer. A unique opportunity to match archaeological investigation with the surviving oral tradition and ancient legend, their grant application had stated. And, for Libby, a career-making opportunity which must go well. That thought collided, as it had done all week, with the acute worry about the parcel which had arrived last Saturday from Gosse Harbour. She had opened it to find it contained an old sketchbook which she remembered from childhood, and she had thumbed through it, seeing the drawings she’d been told were Ellen’s, and smiled at her own scribblings added on wet summer days. A fragment of the legend had been written on the back page, but as she turned to it an object, wrapped in a slip of paper, had slid out from between the pages and onto her lap. This was Ellen’s, her grandmother had written on the paper. A trinket, she’d thought, as she carefully unwrapped it, and then stared down at the object in astonishment. It was a cross about four inches across with four splayed arms, each decorated with a simple circular design while in the centre a larger incised circle framed a deep red stone, and the object seemed to glow against her skin. Gold? Carefully she turned it over, seeing how one of the arms had been folded over to make a loop through which a thong could be threaded so that the cross became a pendant. A simple design, but skilled craftsmanship, and her heart had started to pound as she recognised it for the real thing. An ancient artefact redolent of the early days of Christianity and the emergent northern church. It could only be gold, thin, hand-beaten gold, and the stone was almost certainly a garnet, a stone once much prized. Gold and garnet. The sort of thing that would be owned by an early bishop or other high-ranking churchman, or a devout layman – eighth century in date, if she was right. And she found herself wondering what else might have found its way to Gosse Harbour. The letter which arrived with the parcel had simply said: Ellen used to wear it, my dear, so I thought you’d like to have it. Libby had written straight back asking what else her grandmother could tell her about it, where it had come from, were there other items . . . ? But she had, as yet, had no reply. It was letters, stamps, and patience with Nan, not e-mail. She looked again at the house. The cross had almost certainly come from there, but in what circumstances, and how on earth was she to broach the subject? And with whom? The house was set back within a garden bordered by a stone perimeter wall, masked by a line of shrubs and trees, and all she could see of it in the growing darkness was the roof, a silhouette of little turrets and chimneys. A right old mishmash of architectural styles and now the home of the seventh baronet, Sturrock of Ullaness. It had started life as a late medieval tower house, she had read, and developed from there, with successive extensions and alterations reaching a crescendo in the nineteenth century embellishments of the third baronet. He had, by all accounts, embraced the Romantic movement with well-funded gusto and positioned himself in something of a dream world, rooted in the works of Walter Scott. The family was at home, she noted, seeing thin grey smoke spiralling above the rooftops. Perhaps, in the summer, there would be an opportunity to have a look inside, but on this visit, for all sorts of reasons – not least the arrival of the little cross – Libby intended to stay well below the radar. 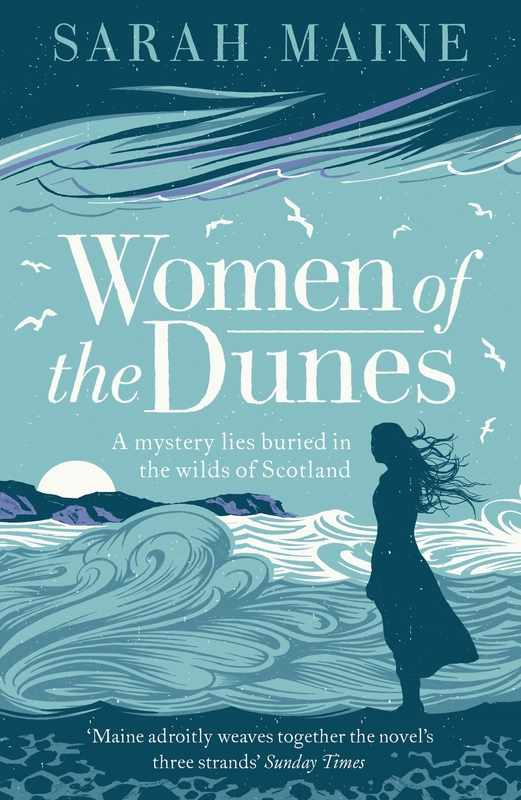 Women of The Dunes is available in paperback now.